Cindy Needham: Featuring Joyce Oberle!!! It's with a big smile on my face that I get to feature my good friend, Joyce Oberle. I met Joyce a few years ago when I was invited to be a guest speaker/teacher for her guild in Orange County, California while she was President. We immediately hit it off and found that we had a lot in common. She attended my Designs Workshop when I was teaching at Superior Threads this past March and this is the piece she created. It was stunning while she was creating it in class and gives me bumps now. Joyce's story is below...thank you Joyce for continuing to inspire me...and the rest of the world! 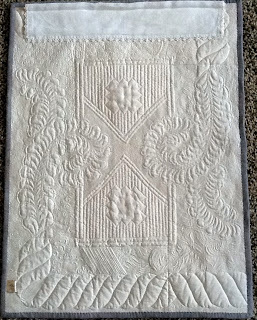 I started this quilt in Cindy's Design Workshop last March at Superior Threads in St. George. What a great class. Anyway, I had hoped to have it completed by the end of March so that I could share it with the participants in a class that I was going to be teaching. Well, that did not happen, so I shared it in its unfinished state. Again, I wanted it completed by July, as I was teaching the same class. Again they saw it incomplete. Once again, I was teaching the same class this October. Well, the same story. 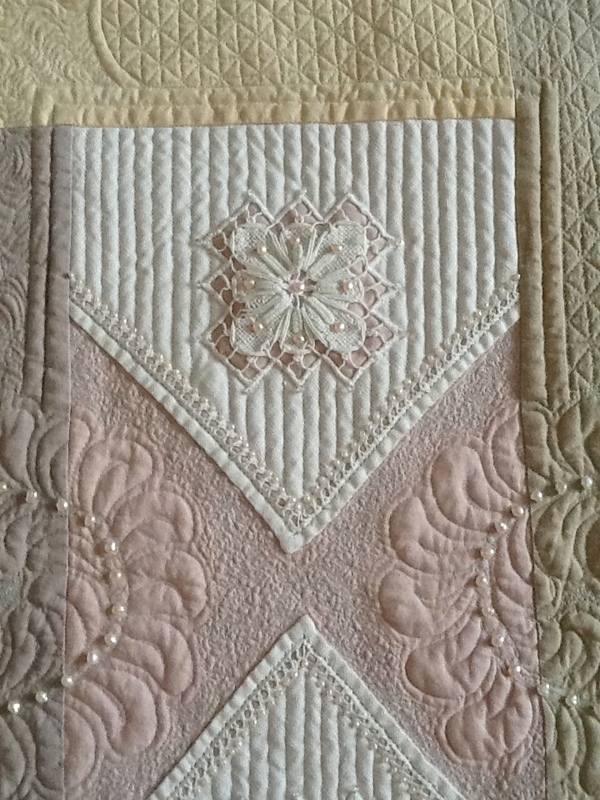 My Quilt Guild is having a Quilt Show November 2nd. I was bound and determined to have it finished and in the show. I stitched the last pearl at midnight, October 30th. It will hang in the show. I am so excited!!! The sleeve is another napkin with the edging crocheted by Grandmother. 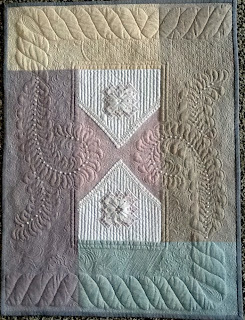 This quilt is my original design. 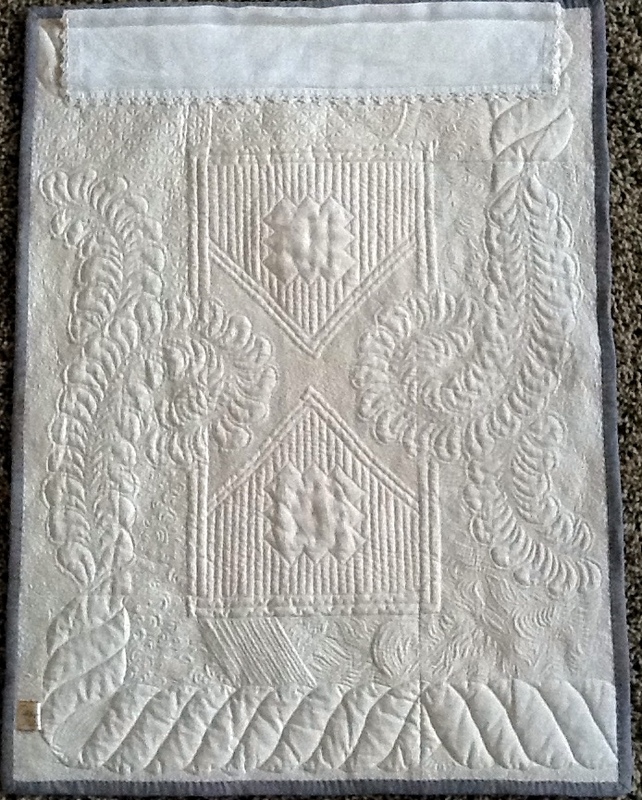 The white fabrics were once dinner napkins that were hand stitched by my husband's Grandmother, Helen Knapp Storey (1889-1980). I incorporated them into this wall hanging to showcase her beautiful stitching. This is a lasting memory of a very special lady, Grandmother Storey. oh so beautiful ~ thank you for posting! Lovely work. Beautiful work! You are a great teacher/instructor too have student work(s) like what's been shown on your blog! congrats to you all! 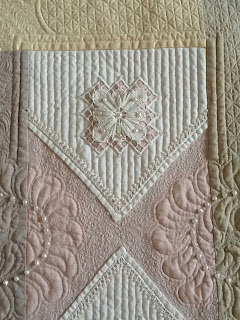 The subtle pastels with that beautiful stitching is so gorgeous/dreamy!!! Thanks for sharing and am so glad it was finally finished (right down to the hanging sleeve!). Love the pearls! What a nice remembrance. 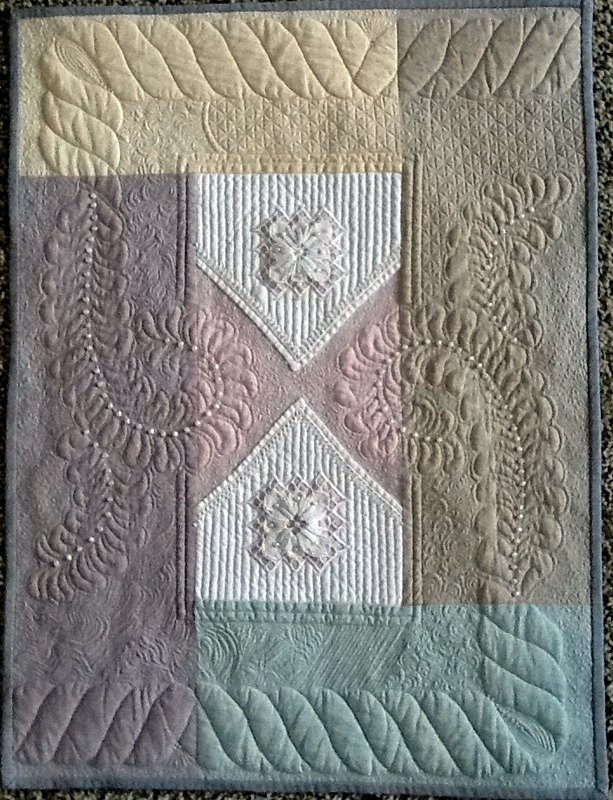 A magnificent quilt Joyce! WOW! I love that Scott's grandmothers napkins are included making it all the more personal and special. I am always in awe of your remarkable talent!